If you're looking for Joanne "JJ" Liu in the field, you usually look for a great hat - although we did sneak this picture of a hatless JJ. JJ collects hats like she collects money finishes. In the ten years that JJ has been playing, she's cashed in over 40 major tournaments, grossing almost $750K. 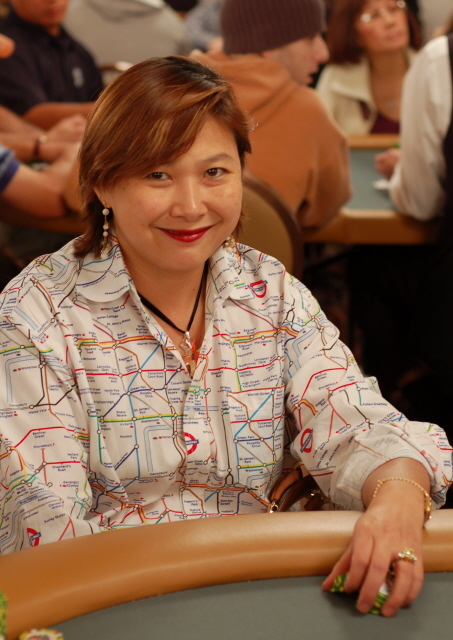 Liu's biggest cash came in December 2005 when she finished 3rd in the WPT Five Diamond Championship event at the Bellagio. She's already cashed twice in the 2006 WSOP. JJ Liu is a proponent of bringing more women into poker. She puts her money where her mouth and gets out to play with the girls when she can. She came in 2nd place at the LIPS event at the Mirage earlier this year. She also had a 2nd place finish in the 2003 WSOP Ladies event. I hope JJ has a special hat picked out for the final table - and I hope we all get to see her in it.